Our guest authors include vets, trainers, PetSafe® employees, and other pet experts. Are you a pet writer? We're always looking for story ideas and guest bloggers. Read our Guest Blogger Guidelines and email us at social@petsafe.net. Learn how to keep your dog safe from collar accidents with stories of dogs who suffered tragic or near-misss collar accidents. Do you know how much of your pet's body is made of water? Saying, “Goodbye,” is never easy, especially to a pet that has been a part of your family. That’s why even a year after making the tough decision to euthanize my cat due to a deadly disease, the wound is still sore. Coupled with the death of another close family member, my cat’s death has left me emotionally spent. There is no doubt that many people view their dogs as family members. In fact many of my clients often use the term "four-legged children" when describing their pets. A recent journal article in Science demonstrated that both people and their dogs experience an increase in the natural bonding hormone oxytocin after a period of interaction. Some researchers theorize the familiar canine characteristics of large eyes, playfulness, and retention of other juvenile traits promote a relationship similar to that of a parent and child. Although the interaction is often very strong and relatively peaceful, just like any other relationship, there can be periods of conflict. Picking the perfect containment system for your pet and your needs can be tricky. Accounting for your pet’s temperament, containment size, cost and more, you may find yourself asking: “What’s so deluxe about Deluxe?” Or “why go wired when wireless is so much easier to setup?” We've come up with this guide to simplfy your search. Vacation season is almost here! If you’re planning a trip and can’t take your pets along, a professional pet sitter may be an option for you. While dogs aren’t capable of resolving anything, the end of December is a good time to take stock of ways to help your dog become healthier and happier. Dr. Trisha Joyce of New York City Veterinary Specialists offers suggestions for pet parent resolutions. This holiday season, experiment with some pet treat receipes instead of that 5-hour-long pie recipe! We found some delicious and healthy treats that your pets will love! These recipes include all the favorite fall ingredients like pumpkin, apples, turkey and more. As pet parents, we're more concerned than ever about what we're feeding our pets. But it can be very difficult to choose the right pet food with so many choices and so many ingredients to research. I asked my vet for a list of dog food brands to try and ones to avoid, and here's the list of vet-recommended foods she gave me. It's hurricane season, so now's the time to prep your emergency plan for your family, including your pets. A disaster can happen anytime, so even if you don't live in a tornado or hurricane zone, it's good to be ready for anything. A do-it-yourself costume will probably cost about half of what you would spend elsewhere, and it will be original and unique to your pet. Why buy a Halloween costume for your pet when you could make one cuter and cheaper? Check out these 15 easy DIY pet costumes. Listen, your pet may have a problem with drinking. Is your pet acting angry but also sort of lethargic? Are they legit trying to find water anywhere they can? Could your pet have a drinking problem? We would like to remember our loving work companion and one of our first office dogs, Abby. Abby came to work with her dad, Bryan, every day for more than 12 years, even up to her last day. She will be greatly missed by everyone here at PetSafe® brand. Bryan has written this heartwarming article to memorialize his great companion. To begin, I’d like to say emphatically that living with and training a deaf dog isn't harder than with a hearing dog, it's just different, primarily for us. For deaf dogs, especially for those born deaf, it's just life as usual. Celebrate the holidays with these peanut butter puppy treats! With a little sewing DIY skills, you can to learn how to make your own personalized scarf with your pet on it. I just completed scent discrimination classes at my local kennel club. What fun we had! I will put Jack in a room, then go around the house hiding treat filled Easter eggs. I then instruct him to “Find It” as he hunts around the house looking for goodies. I might be a little (a lot) obsessed with my dogs. My husband doesn’t share these feelings. Get ready for the Bark For Your Park contest in 2015! Rally training for dogs is like rally racing for cars. Jack and I competed in UKC rally obedience trials. 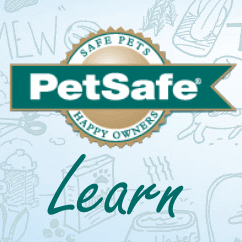 We bring you the best PetSafe videos featuring our favorite furry feline friends! Fall and winter weather is not always fun for you to stand around in while waiting for your pet to potty, so here are my picks for great pet doors to consider this upcoming season. What takes only 5 minutes and can mean the difference between bringing home your lost pet or losing him forever? If you are looking for a place to keep your pets while you're out of town, here are some helpful hints. Video shoots are always fun, and they make us love our dogs even more.These are all great moments of being stage pet parents. While family additions might be exciting for the people, our dogs might have a different view. If you’re introducing a new baby to the family, you’ll really want to do some prep work. Getting your dog outside to potty is a hassle when you live in a high rise or don't have a yard. Indoor potty training products can help! Have you ever had a dog who reminds you it’s dinner time even if you aren’t even near the kitchen? That’s a well-established routine that a dog counts on. Once you get your potty training system, you’ll no longer have to worry about your puppy peeing on the carpet, your senior dog struggling down the back steps to the yard, or walking down your apartment stairs to the yard. What's next for the Bark For Your Park contest in 2015? Our favorite Bark For Your Park followers showed us they really care about their community dogs. Each time you reach for your bottle of water to keep yourself healthy and hydrated, think of your pet. These furry guys depend on us for access to fresh water. This July, join PetSafe in our quest to bring more awareness to Pet Hydration. Sometimes you won’t know a dog’s history when you adopt him, and there are plenty of products that can help make the transition go well. How much water does your pet drink? Dehydration in our pets can be very dangerous. Learn how to keep your pet healthy in the summer heat. Meet the office dogs who make it a joy to work at PetSafe. You might be inspired to bring your dog to work too. Enjoy travel with your pets with a wireless fence. Just as our dogs have always helped us connect with each other, the pursuit of a dog park has the exact same effect on community members. A remote trainer helped my "running back" dog learn to come when called and stop running into the street. Less crime? More tourism? Higher property values? What else can a dog park give your community? 6 reasons your dog is begging you for a dog park. The Blog Paws 2014 conference was a blast! You'll never guess what kind of animal we met wearing a harness. Pet parents deserve a special day, too. Traveling with your pets can be stressful for you and your pets. Follow these tips to keep them comfy and make travel a breeeze. How can you keep your pet well behaved when you're not at home? It's easy with the Train 'n Praise! Who's behind the phone when you call to ask about installing a pet door or troubleshooting your in-ground fence? Meet some of our fabulous Customer Care associates. You could be one of the winners of Bark For Your Park and receive a dog park for your community. Get barking now! Get outside now and enjoy that lovely weather with your pets! Have you ever wanted to dress up and enjoy a night out with the best dinner guest ever-- your dog? Nashville Humane Society actually did it! Teaching your foster dog the basics of living in a home with people and other pets starts with setting realistic goals. This week the PetSafe® Brand team headed south to Orlando, Florida to bask in the glow of the 2014 Global Pet Expo. Introducing the new way to teach your dog to stop barking with an automatic treat dispenser. I always thought my cat Rocco slept all day when my husband and I were away at work. Well, boy was I wrong. We're making these shelter cats stars in our next photoshoots. It's easy to keep your dog's mouth clean and healthy with dental toys and treats from PetSafe.